Thanks everyone at Funtime Birdy, Buster is having a blast on his new turf.. yeah, his turf. Thank you Ann Zych for the foot toys, he stands on one of the perch's and holds his purple dinosaur at the same time. He just loves it and so do I. The assembly went great, not a problem there at all. I sat the gym on my bed and now Buster can be with me happily while we watch tv together...lol. Instead of just poopin at will (and it's not usually on the towel I layed down), now he just sits on his new digs and rules the bed now. First, I have to say WOW to the care in packing and presentation of the Sophomore playgym. It was so nice to see the love by just only opening the box. Then when I moved on to the putting together portion it was just as exciting. Thank you for the samples too. That was also a very nice surprise. This playgym is absolutely wonderful. From the communication with you, to the packaging, to the presentation, to the construction and quality of your workmanship. Your gyms are so well made. I was very impressed with your gyms, toys and customer service! I recently purchased 8 Playgyms from you ranging from you Sophomore size(Cockatiel) to your senior size (Cockatoo) and I must say everyone of my birds loves their plagyms. My phobic Cockatoo Whippy who usually doesn't do well with new things jumped right on the Senior Playgym and started playing. I was so impressed. Chippy my African Grey loves the tape roll toy on your Junior Playgym. Thanks for making such wonderful products! Your pet-stand is just the best! Over the years, we tried other pet-stands, but they couldn't stand up to an Amazon. This one can. It's where James watches TV every night. It's positioned so if he wants, he can come over to me for a love or he can climb down and play games in my lap with the magazine or book I'm reading. Thanks Ann for a great product and a terrific newsletter! James LOVES his new foot toys! I can't believe I didn't discover them years and years ago. As I mentioned before, James has been with our family for 30 years and never was much for the bigger birdie chew toys so I just quit buying them. But these smaller foot toys are just perfect especially the wood ones. Thank you so much for thinking to send those earlier samples. What a lot of fun you created for our little green buddy! You are always a pleasure to work with. You are very concerned about getting the right product for my particular bird. You sometimes make me feel as if I am your only customer. You always keep me informed if there will be delays. All four of my birds are absolutely crazy about your products. The bright colors and the materials used are very much appreciated and enjoyed. I always feel I have gotten my moneys worth! My little Amazon Roz is absolutely nuts for her Merry-Go Round of Fun. She gets so caught up in chewing and hanging on it she forgets herself and falls off! Thanks for such wonderful toys!! I just wanted to let you know how much I enjoy your newsletter. I forward them to my friends and they love it too. I ordered a play gym from you a while back and my bird still loves it. I would always tell people about you and what great stuff you have. Thank you for adjusting my shipping charge. Not many vendors would do that. The Birdy Playgym arrived and I must say not only is it super easy to assemble, but it is so cute! My baby Parrotlet arrived by plane late yesterday afternoon and I cannot wait until I have him trained enough to introduce him to the gym. I have referred the breeder of my bird and my avian vet to your site all of us agree that we have never seen bird gyms quite like yours before. Not only are they unique, come with toys, but they are quite affordable too! I of course have the Freshman Playgym and I love the fact that I will be able to take it from room to room with me or traveling if I want. I show dogs so I deal with vendors over the internet and in person and I just can't believe what personal service you deliver. It's rare to find that any more, and I cannot say how much that means to me as a customer. Thank you! Well anyway I just wanted to let you know that I'm pretty sure Levi will love the gym and I will send you photos once he learns how to use it. We cannot thank you and Mark enough for all of your help. Big business could learn huge lessons from the customer service you offer. To say you went above and beyond minimizes the appreciation we have for all that you did to ensure that we had our cage quickly. I had hoped it would arrive within a week but you got it to us within 48 hours of our ordering it! We were stunned when our baby's delivery date was bumped up. Your excellent communication and follow up relieved our anxiety. Thank you so much! I had been a bit worried about putting the cage together but was delighted with how easy it was! We saved (literally) the same amount as the cage costs locally by purchasing through you. After our cage arrived, I did find a twin to ours in a pet supply store in town ... for exactly twice the price! Thank you again for your huge part in giving Kiwi an easy transition to her new home. Yep, I thought you would approve of her name! We have already referred two friends to you. Thank you so much for following up to see how Tomo likes his new play gym! Tomo loves it! Tomo was so excited when the new play gym arrived. He really enjoys playing on the chain and hanging upside down to play with the creative and colorful toys. Tomo also enjoys flying from his food bowl to his water bowl then to the toys. At the end of the day, Tomo is tuckered out from all of the fun he has had all day. We also like the stand for the play gym. It is great that we can roll the play gym on its stand to any room in the house so that Tomo can be with us wherever we are. Thank you for constructing such a wonderful gym, toys, and stand! I will send you pictures of Tomo on his play gym soon! Had I known all this stuff was going to be so great I would have ordered double of everything!!!! I am pleased with everything!!!! I was worried about the cost of toys when my husband got the bird for me before he went to Iraq, and I have ordered from other places not to get even close to what your company provided. I really wanted to take a moment and thank you for a job well done. As a first time customer, I can't tell you how impressed I was with your company. The packaging, the speed in which my order was delivered, the quality of the product and even the little surprises inside were all just amazing. I felt like a kid on Christmas morning! Butchy, Baby Lilah and Mr. Pugsley love their new toys too! From all of us, thanks so much. I've got to tell you . . . Sonny absolutely LOVES your toys. As he is just a baby and babies don't usually get too involved with toys, your toys are the exception to the rule. He really plays with them. Thank you very much and I will send you a photo. You�re wonderful, amazing and stupendous! The order came late yesterday and as usual was everything and more. Jasper dove right in and found the little �extras� that you sent and sends you lots of kisses. Just wanted to let you know that everything arrived yesterday, and the toys are beautiful!!! Thank you for your wondereful response, and for the extra "goodies" -- surely do appreciate them, I assure you. Once again, Fun Time Birdy scores!! My kids bought the Sophomore playgym from your website. It's funny that you're located so close by, yet my son had the playgym shipped to his apartment near Boston, Mass., just to keep it a secret. My birds love it. In fact, I already owned the King's Cage acrylic playgym. When I got your gym, I loved it so much (and so did my birds! ), that I attempted to sell the acrylic one on Craigslist. A woman was going to come all the way from Brooklyn to buy it, but I broke down and convinced her to purchase the FunTime Birdy gym for her lovebirds instead! I even sent her your website link. Now you know why I don't work as a salesman!! You also know why I still have that acrylic gym tucked away somewhere. Happy Thanksgiving to all of you at FunTime Birdy! Thanks so much for checking in with me about the toys. They both LOVE their toys! Sammy loves plastic and the toy was so colorful and a very nice addition to his cage. He is ripping it apart as we speak. As for Cherry, the toy is bigger than her which is a good thing. Being a Macaw, she needs big toys and the wood is thick and very nice for her large beak to chomp away at. Thanks again for all of you help! You made my experience with FunTime Birdy easy and painless! How nice of you to check in with me on this! Bandit is totally enjoying the toy I put in his cage and, surprisingly, even Verde is destroying the toy I put in his cage as well - this is a first! I almost feel like I've struck gold with him! Wordy Bird hasn't touched his toy that I can tell and the other two are still working on toys I had in their cage, so I haven't replaced them just yet, not to mention I've been dealing with some health issues with Precious. I probably will give them new toys this weekend. I don't have any pictures as I'm not home during the day when they are in "detroy" mode, but if I am able to do so during my days off for Christmas, I will certainly send them along. Thank you again for checking in - this is a very nice of you to take the time to do! You are a great business woman and I'm so glad I found you and your site. I'll look forward to receiving the newsletter. Jasper loves his toys! And you made a big hit with him with the sample foot toys and food that you sent. I love the fact that you take the extra time to �address� the package to Jasper. Your extra care and customer service is greatly appreciated and we will definitely be ordering from you again. In fact, Jasper recommended you to his buddy Jesse who got his owner Lori to order him the same toy! I just wanted to let you know Jesse's toys came today. He loves them! And, thank you so much for the sample foot toys and goodies....All the birds love them! I will definitely be a lifetime customer! Excellent playgym can't wait to see our new 4 parakeets use it. We just got them 4 days ago. Shylow, Lilly, Vinney and Fionia. I have been telling them they have a "play gym come on out and play". Thank You for a Great Playgym and the extra birdy treats and foot toys. When they come out I will take a photo of them. I'm sure they want to show off there new gym. Harley has just finished off the last one, and will be getting the new one tomorrow. He loves that toy. I love dealing with you for bird toys. You are so nice and your toys are great. The bird gym is a Christmas present for my mom. I'm not allowed to keep birds in my apartment! Thank you for following up. It is a wise business strategy, especially since many businesses are resorting to impersonal practices these past few years. Plus it shows that you care about your customers, which says a lot. I received the toys and am very happy with them. They exceeded expectations. Sometimes when ordering online its hard to get a good idea of the size of a toy (even with measurements included as I am not good at envisioning the size of the toy) and I am sometimes disappointed at how small it is even when they say it is for the "big guys" and "heavy chewers". Your toys were actually larger than I imagined and with your sale at a great price. I will try to get a picture of my guys playing with a toy and send it along. Thank you so much. I was just getting ready to sit down and send this note, when UPS came to the door with the order. I've opened everything up, and looked through it, but I don't think I'll have time to get it put together until tomorrow. Pat from New York highly recommended your company to me. She and her flock (Carlos, Tequila and Mango) raved about the products, and the service. Thanks again for the fast service. Thank you so much for checking up on JoJo to see if he like his new playgym! What great customer service....something that is so rare nowadays. Anyway, JoJo LOVES his playgym. He gets mad when we try to put him back in his cage. Thanks again for the follow-up! Ruby Jean just loves her new Junior Playgym. The playgym is everything you said it would be. Very sturdy easy to put together in fact, Ruby even helped me put it together. "If I knew then what I know now I would never have bought any other playgym but yours". Ruby and I thank you for a great product. By the way your Super Pop toy which I put in Ruby's cage is one of her favorite toys. I absolutely love the play gym, it is adorable, fits nicely into any space, and so very well made. I am not a put together kind of person, but it was so easy to assemble. I will definitely recommend this product to any of my friends with fids. You also put together a beautiful newsletter with the most endearing stories, and I would love it, if the next newsletter would include pictures of your Thanksgiving dinner with your fids around the table.. There are many of us who would truly appreciate seeing them. Thank-you for a beautiful play gym, and for sending it as quickly as you did. McGee loves the Willow Tree Playgym! There was no "getting comfortable with it" he stepped on and tested everything out. It is really great. He has a ball that he keeps balancing on top of the tree while he nips at the blocks. I'll take some pictures soon and send them off. Bubba, Humphrey and Olive love the play gym and toys. You are a hit here in my house. What a great play gym you make. I do not know how to take pictures and post them. If I can ever figure it out, I would love to send you pictures. I just wanted to pass to you that Mika continues to make FunTime Birdy toys her first choice. Today I swapped FOUR toys on her play gym because she either hadn't been very interested or I wanted to disinfect them. When I put the new toys on, I introduced her to each one and showed her how they were set up. Your toy was definitely the one she preferred. In her cage she has the sophomore mini spin me round that she plays with most. I have another one ready to replace the current one with when she lets me retire it. She also has a sophomore moppy frog that is in the "shadier" part of her cage that she thoroughly enjoys. And today I introduced her to the sophomore party animal. All are winners as far as she (and I) are concerned. Thanks for writing. Joshie loved the toys. In fact, he played with these toys more than most toys I bought for him in the past. He also was excited about the box being sent directly to him. His 2nd birthday is coming up soon and I'm going to try to buy him something for his birthday. I'll take a picture in the future and send it to you. Thank you for the promotional code for the discount off future orders. I appreciate it very much and just want to tell you what a pleasure it has been to deal with your company. I own a business too (flower shop) and I find that really good customer service is not easy to come by these days, because most people just don't really care if you are satisfied or not. It's nice to see someone actually does! I just wanted to let you know that you guys give great customer service; something that is rare these days. I love how you personalize the emails for your customers and show that you truly care. Hedwig is still taking the time to get use to his new playpen, but he is coming around. He has already chewed through some of the wood blocks on the Fashionable Bear toy, he seems to love it. I cannot wait to put the DVD on and see how Hedwig likes it. I will try to take some pictures of Hedwig on his playgym and email them to you. I think that it is great that you offer 10% preferred customer discount, that is such excellent news! The playgym is well-made and was super easy to put together. I love the design; it is so much better than the playgym I have, it is roomier and so easy to clean. Also thank you for the free sample toys and treats. You have alot of great products, I can't wait to see what else you come up with. You have a wonderful variety of toys! I found exactly what I was looking for on this site. I received my shipment very quickly I was surprised because I had a feeling it would take longer. I like how you put a sticker on it with my Cockatiel's name which makes it more personable. I received an email thanking me for my purchase which was thoughtful it shows you that you really do care and appreciate our business. Amazing!! I received the parcel today and was pleased to see all the toys. I am sure Pyro will enjoy playing with them. Thank you very much for prompt replies to all my queries and then immediate shipping of my order. Your gesture of adding sample foot toys and offering life time discount is very much appreciated. Thanks so much for the extra toys you included and following up on how they like their toys!! That makes you and your company stand above the rest! They love their toys! I will see about getting a picture or two of my babies destroying the toys! Thank you so much for all your wonderful customer service and personal attention to make sure everyone is happy! Your customer service is excellent. What a great experience! My items arrived quickly and you even included free stuff! Everyone likes something free for their pet! The second time I ordered from you I received a returning customer discount which was great - you don't run into that very often either. Oak loves his play stand. It is so cute. So easy to put together the kids did it themselves. Also, Oak can't get enough of his "Freshman Out of this World Toy"!! Oak will scream and say let me out of my cage and get me on that Playgym!! We will send you a picture of him on it! I will let my friends know of your site. So Fun!!!! Thanks so much for the note and all the fantastic and personal service, Ann, such a far cry from the disinterested if now downright hostile interactions one often receives from the operators hired by corporations to talk to customers. We'll get back to you shortly about the other stuff. And thanks for taking the time and effort to contact the cage manufacturers in order to secure the cages in a timely manner, and we are excited that they're both available in platinum. Double Yellow Headed Baby Mae (just over a year old and playing with your toys since 3 months old) really loves your toys. The other Amazons are twenty-something wild caught and not as good at playing with big toys. They like the pieces after Mae tears them apart. Jibber the Grey likes all the toys but is unsure about the play gym, which Mae "owns!" The "Flock" gives your toys highest ratings! Jibber really attacked the toy with the Mickey Mouse type soft plastics. I think he found them a revelation! Mae liked the one with the dinosaurs. She hangs by one foot and grabs it with the other and bites it. Ralphie likes the one with the blocks and keys. She rings the bell whenever she climbs down onto her low perch. I am not exactly sure of the significance, but it seems like, "I am here. I exist." I just adopted Ralphie who is about 25. She had been in a dark corner for several years with no toys. She really loves toys! Errol is neophobic, so his toy is sitting three feet from his cage for a few weeks. Then it will move closer. Thanks for the great toys! What great Customer Service and what a great Product!!!!! The playgym is so well made. It really shows that you made it with a lot of care and thought. When I started to put it together both Gina and Nadia got so excited they couldn't wait to get on and play. I just loved the playgym but what is most important to me is the fact that my birds loved it. Thanks for making such a great product. I will be purchasing the larger playgym for my Amazon. Thank you for the email and following up with me since I'm a new customer to your business. The package arrived tonight and I quickly assembled the play gym. The items purchased will be a gift for my mom who actually is Lem's owner and lives about 45 miles from my home. I expect to see my mom in the next couple of weeks and think she will be very impressed with the play gym and toys. Lem will be very happy with them too! I used to be a bird owner myself about 10 years ago and am considering becoming a new bird owner in the near future. The play gym and toys look great. It's really refreshing to see and experience the customer care that you put into your business with the products available, email, and note included on the package invoice. This was my first time shopping experience with Fun Time Birdy and I am very satisfied. After receiving the items I ordered I received a follow up letter from the company asking about the toys I ordered and thanking me for the order. Alex had fun today--he discovered the plastic toys and chewed one. Sam is still "eyeing" his toy. Sometimes I think he does this just to annoy me. I will let you know when he decided to have fun. Thanks for checking in. Mojo likes his new playgym. Thanks again, we are looking forward to getting your newsletter. The playgym arrived last night. It is absolutely wonderful, great quality, even larger than expected. Well worth the cost and it is also great that replacement parts are available at low rates so that it can last a lifetime. I love that any toy can be put on the toy bar. We received all of the toys before Christmas! Everyone is very happy with their new loot! Max, my older Grey has really taken to the plastic. Tater has always loved it. Roz is as happy as a clam hanging upside down on her toys screaming! Skippy, who's very unafraid of anyone is still getting used to the idea of her new toy. Once she decides it's all right she'll make sticks of it. Thanks for such great toys! Happy Holidays to you too! It is so nice that you wrote to see how Hedwig is enjoying his toys. He has already destroyed the Christmas pop toy, all there is left are the tiny Christmas trees. He likes to perch on top of the spider toy. I just put in the prehistoric toy and he has yet to destroy it. Thank you for all the great toys!!! I'll be sure to buy some more soon. Well, thank you very much for writing. The Swing I got from you is her favorite. She finally figured out how to use it (ha) and she is a trip to watch. As soon as I can get a chance I will send you a photo of her and the toys I got from you. I for sure will order more soon. Thank you for the catalog and the time you took to write. Thank you so much for your email. It is so kind of you. I love your added touches! Echo's name on the shipping box. The letter E as a sample foot toy. Very cute. The bell is wonderful. He loves those toys and I am glad I found a place that sells them. When we start going through our supply, I will be sure to remember to order from you again. Just wanted to let you know that the playgym and toy just arrived (before Christmas!). I have not opened it yet but I am thrilled it got here in time! Thanks so much for getting it out ASAP! Great customer service! Rica needed a spot in the kitchen and she feels secure on this one. The design does encourage movement -- clever. I like that it is easy to clean up. Angel loved her foraging and kabob toys!! I will be ordering more soon. We also have a rose breasted cockatoo that we will be ordering toys for as well!!! I bought this gym for my parakeets (4) now I am buying one for my parolette the workmanship is great! I wanted to let you know that I did what you suggested and it worked!! Wednesday loves the playset so much, we are so happy finally she seems content. I will send you a pic when her feathers grow, she is molting and looks AWEFUL!! Thank you again for your tips and ideas I really appreciate the help. Thank you so much -- you are such a sweetheart! And I have to tell you -- your E-Mail just gave me warm-fuzzies; thank you for that. I guess it just surprised me that a real human was on the other side of my order, instead of a big, huge electronic store -- what a nice surprise! Your Marshmallow sounds adorable, and I can tell how much you love her. Please give her a little Christmas kiss and rub on the head for me, and a Christmas hug to you from me, too! The Happiest Of Holidays To You and Yours! Snapple loves his new toys. I've only given him one to start w/ (the Jurassic park one) so that he has something to look forward to in a couple of weeks!!! I'll get some pics of him w/ his toys. Thanks for thinking of him. He's quite the finicky little bird when it comes to toys, but he does like the plastic ones like yours b/c he can chew them to bits!!! Thanks for checking in on us. I was 100% satisfied w/ your service and products. You're now on my favorites!!! I just want to thank you for my toys! I helped Mom open the box (that was fun too), and couldn't believe all the cool goodies inside. I don't know what I want to try first! I will let you know how I like everything once I chew on it for a while! Thanks so very much for taking the time to check for the discount. Most (especially internet based companies) would never bother to do that! I greatly appreciate the extra time that you took! Blizzard, in his usual fashion, just hopped right onto the playgym and started to investigate everything. He is very active, very inquizative and loves new things. Cloud, well, he is more hesitant - he will take his time, sit back and watch to see if anything bad will happen!! So, he will hop around the base of it for now. He does like the dangling bear bells, when Blizzard will give him a chance to play with it! Thanks also for including all the treats! That was wonderful. Thanks again Ann, I hope you have a wonderful Christmas and New Year! I am absolutely thrilled with the play gym! I have purchased numerous play gyms from pet shops, eBay , etc and yours by far is the best I have bought in a long time. Jessie is getting use to her play gym. She is still young and has not mastered getting from perch to perch in her own cage let alone her play gym but she will eventually figure it out. I will work on getting you some pictures of her on it for your gallery and send them to you. The toys and treats are great. High quality and colorful. I will be ordering again from you soon. Pretty girl loves her new play gym. She has already torn up some of the toys but had a great time doing it. Mia loved her toy. Thanks for the gifts. She loves nutri berries and I ran out so she appreciated it. I'll take a picture of her soon and send it to you. Thanks for writing, Mia thanks you too. The bride and groom were really happy with the gym. "Zeke loves it!" is what they said at the wedding... and they appreciated someone getting something they really wanted. Love your products. I have four birds and the Sun Conure Tapanga loves them too. She is a chewer. The paper roll is a favorite, as she loves to pull on it and bite it. Dexter loves all of the new toys his favorite is the one with the roll of paper. He somehow manages to drape the paper all over his cage while chewing it. If you have ever seen a house that kids have T-papered you can imagine what it looks like. Thanks for checking he's thrilled especially loves all the different perches and the added toy with all the bells I ordered with the play gym. He's on it at 5 in the morning before I even uncover his cage. It's in the bottom of his cage, the cage is 4 feet high by 5 feet long, so it fits great on the bottom. As you probably know, parakeets are little helicopters (they like to go up and down as well as back and forth), so it's great for him to have a reason to hike on down to the bottom. I'll snap some pictures and send them along. Thank you for the toys and the discount! Hedwig loves his new toys. He is starting to really like the plastic foot toys, (thanks for some sample foot toys from a previous order) which is when I decided to purchase the foot toy package. The little plastic toys are sooo adorable!! Syd LOVES the little plastic toys! He thinks those are the best chew toys ever. He fell "in love" with the popsicle sticks and petted and preened them until he untied the knot and they fell apart. Under the heading , Some birds are too smart for their own good, Syd watched as we took apart the little house that holds the nuts and reassembled it. When we put it in the cage the first thing he did was get underneath it, turn the screw and drop the bottom off. Then he got the nuts. We went through this a couple times. He doesn't bother with chewing the dowels. lol. Over-all I give all these products high marks...Well, Syd the Cockatoo does. A happy birdy is a good thing when you have to sleep during the day. Micheal loves his toys! Thank you so much for the extra treats and extra toys as well! I am glad you emailed, I have been meaning to email you a thank you but holiday madness has already set in!. Thanks for the excellent customer service. So far, Sammy seems to really love his playground! It's very well made, and seems perfect for parakeets. Thanks so much for the birdie snacks you included. I think Harley does remember the spider- he seems to be enjoying it as much as ever. Thanks Ann, it's always a pleasure to be your customer. Oh yeah the toys were a great hit! Nakita being herself has just about chewed some of the pieces off and I will use the replacements. They loved their new toys and the prices were good too. I love the Birdie Gym! It is so beautiful and the best I've seen anywhere. I just got my Rose Breasted on Sunday and the African Grey is still too young (7 wks) I will be getting him in a month. I will be sure to send photos very soon. I just received my 2 Freshman play gyms, toys and extra goodies you sent us. The toys are so cute and my budgies and lovebirds LOVE their new play gyms! Thank you for really putting the personal touch into the order....from contacting me to adjust shipping charges, to sending the neat little treats with the order, to checking up on us.....you've really gone the extra mile! Monte loves his FunTime Birdy Sophomore Playgym and Stand. The stand is easy to assemble and move around. Saturday mornings are spent playing on his new stand and watching the wild birds at the feeders on the deck. I just wanted to say a quick thanks for everything you did to get me and Ali our Sophomore playgym. She loves it and the day it came, i was at work till 11:30 at night so when I came home I opened it right away, woke Ali up and let her play!! It's soo well made and she really enjoyed the toys as well as the foot toys. I will send pictures as soon as I download the software from my new camera. I have ordered cages from you twice now and I have been completely satisfied both times. Your customer support is miles above most. I have been recommending you to anyone who asks. I know my birdies love your toys because the bottom of their cages looks like a confetti factory exploded. They really are great toys. Thanks also for the "extra" package. I'm very glad that I ordered from you. No one should have any qualms about doing business with you and FunTime Birdy. You strive to maintain high standards in customer service and satisfaction, and you are extremely pleasant should anyone ever need to call you. Kira and Coco love their toys! Coco occasionally gets in an "Amazon" mood where he turns into a frenzied feathered wood chipping machine - and does an excellent job of producing his own cage litter! He then walks around on his cage grate laughing maniacally. After that he sings opera. Good thing we are a decent distance from our neighbors. Thanks for making great toys! I just received the Junior playgym for Toni. It' wonderful! I am so very satisfied. It was so easy to put together!! The best part of all is that Toni absolutely loves it! Skittles loves to hang out on the playgym and keep me company as I cook dinner or do the laundry. Your products are of the highest quality. Thanks so much for the great service and for making it personal. That means a lot to us! Also appreciate you adjusting our shipping charge -you rock! I'm sure Paco will love it. Snooky loves her new cage!! Took her a while to get used to it, but she is now back to herself. My guys are enjoying the Senior Playgym more and more. My little female Umbie was overwhelmed for a while, but has been jumping onto it the past week or so. Of course I keep finding little shreds of colored plastic all over the place, along with lots of lovely colored toothpicks, so it's doing the job. The toys are really high quality; Titan has figured them out, of course, but enjoys them. I shall look for an opportunity to showcase Titan with your great toys! Thanks for following up...Ace loves his new playgym and toys! Lucy is still a little baby. She was born 7/13/2007, so we do not have her yet. We are sure looking forward to taking her home. It looks like that is going to be in October. But the cage is great. Thank you for your interest in customer satisfaction. It is a pleasure doing business with a company that cares. You may use anything I write in your testimonial. In this day and age it is hard to get this kind of service. I could get used to it. Cheeto is a funny bird. He loves hanging out on the playgym. I wish he'd sit on the perch instead of inside the food bowl! He's very young, only 8 weeks old. My kids are having a blast playing with him. Thanks for such quick delivery also. I couldn't believe how fast it came! I searched online for days to find something that I liked. Cortez has finally relaxed enough to begin enjoying his playgym. At first, he was a bit intimidated by the whole thing (he can be like that) but with some cajoling and luring with his favorite treats (sunflower seeds) to get him to explore the entire gym, he is finally jumping and walking and playing all around. I just popped him back in his cage after him spending 2 hours on it this morning on the kitchen counter while I got the kids off to school and the kitchen put back together. Thanks so much, you have given us both a great gift--he gets to spend so much more time outside of his cage now that he has a safe place to be other than my shoulder, nibbling on my ears. :-) What used to be an hour or so of playtime everyday has now expanded to much more than that with the playgym. I'll take some pictures in the coming days and send them. Received our order and absolutely love the toys! I know that Ze' will enjoy them as well. I look forward to finding more goodies from your store! Thanks so much for the email. Murphy and Jack love the playgym. I will take pictures of them on it and send it to you. Thanks so much for the fast delivery. Also thanks for the treats. I thought that was really nice of you to send them and Murphy and Jack thank you also. They love those treats. I am sure I will be ordering again soon. The birds are delighted with their toys and playgym. I am very happy with the customer service you provide and have recommended your site to other bird nuts that I know. The playgym is working out great. Everyone likes it so much. My Meyer's loves it, even though it's a little small for her. For some reason she likes toys for little birds. I think it makes her feel big : ) She likes to hop from one low perch to another. She goes out of her way to never land on the bottom for some reason. It's like she's a kid pretending the ground is hot lava! The lovebirds like to land on the perch b/c it's halfway between their cages and the big perch in the window. Taco (a caique) likes it too, but he's too rough on it, so he doesn't get to play on it. I'll have to get him one of the bigger versions one day. My Meyers is also loving her new toy (the one with wood blocks and plastic frogs). She saves little bits of the wood in her extra dish. Thank you so much. You are truly a gem. What fantastic customer service!!! You are very kind to not only take the extra time to custom design something for Merlin, but to follow up as well. I hope to have it put together and a picture taken to send you by end of week so you can see how much Merlin (and his Mom) appreciate your extra effort. I just arrived at my destination and while I have been traveling, my husband has been putting Merlin's play gym together. He said it is absolutely fabulous. I can't wait to get home and see Merlin play on it. I will try to send you a picture on Thursday or Friday so you can see how cute he looks on it. Thanks again for your extra special customer service. You have a customer for life. You are obviously very committed to service and the integrity of your product. Your products are of very high quality, and are unique in its concept/design. I will definitely order from you again, and will recommend you to others. Thank you for following up with me. I am very happy with the playgym...Schneally loves it. I just can't believe how quickly it got to me. Also, thank you for the bird treats and the personalized note. When I have some pictures of her on the gym, I will send them to you. I am a very satisfied customer who will order from you again. Anabelle and Katie love their toys! I will be ordering from you again!! Hope you are keeping well just a quick note to tell you that Cheeko loves the gym. Thanks for the help with Sophie's play gym and toys. She likes them a lot and climbs from one side to the other over and over. It's such good exercise for her. I'm not that computer savvy and do not know as of yet how to e-mail pictures, but maybe I can get my husband to give me a hand with that. Thank You very much for your help and I'll see what I can do about the pictures. Thank you for getting the Playgym to us so quickly! Gracie is on it now---eating seeds from one of the food cups. I am very happy w/ the Gym and I also want to thank you for the extras---toy and food samples :-). We will order from you again in the future. I have taken some photos of Gracie on her play-gym and will get on to you. I want to report the Sr. Playgym has arrived! I put it together in no time while 3 curious fids supervised. Kiyara is a big chicken, so he (we thought was a "she" when we named him) sat on his cage observing from a safe distance. Alex was more interested in the packing bubbles, and James, he thought the box tasted pretty good. As soon as I can get some action shots, I'll forward them your way. Thank you for such a great product! Thanks for your e-mail. Zooey likes the playgym and new toys. I don't have a digital camera, so can't send a photo. I think the playgym with the toys is a great value and well made. His old one that I got at a local store was more expensive and not as well made as this one! Thanks for checking in and best wishes in 2010! Bradley, is a little afraid of his playgym but we are working on it. I love the playgym, I think Bradley is afraid of his own shadow. Thank you so much for his treats, that was so thoughtful of you. I will send you a picture he will eat his food from the playgym. I promise to get a picture to you asap. Rio is now very happy playing on his new gym. He was a little intimidated at first, but he has now made himself at home and happily destroyed one of the toys already. I am very pleased with the playgym and toys and will send a picture to you as well. George is a Sulphur Crested Cockatoo. I loose track but I think he's 4. Timmy our parrotlet and George are like Mutt and Jeff and absolutely adorable. Timmy says everything George does. He's like a mini me. They love the toys. Georgie in particular dug right into the one I hung in the middle of his hanging perch. There was plastic all over the living room floor! He had a ball. Thank you for asking about my new little baby "Mango". She is only 4 months old. At first like with anything new there was some unsuredness, but after a little bit she was stepping on the different perches. Her biggest pleasure is getting over to the food dish and "pigging" out on her fav food. She does not go to the water too much, but has started to play with the hanging toys. I will try to get some pics. I do not have a computer right now (using libraries) but I might send some pics snail mail so you can see how she is doing on her gym. What a wonderful painless transaction!!! I will definitely buy from you again! Ruby has begun to play with her new toys. It usually takes her a day or so to warm up to new things on or in her cage, I usually only put new ones out one or two at a time to get her used to it. Thanks again for your interest and I appreciate your communication, that doesn't happen to often these days! The 3 Senior Spinning Molecule toys came today. I am delighted with the toys. Thank you for a new type of toy experience for the Macaws---it is hard to find something new. I will be back for more--I have 20 parrots to please. The birds liked their new toys. Gozi is like a Pit Bull with toilet paper. I will recommend your Co. and products to anyone that I know. Your products and service has been excellent every time I have ordered from you. Just wanted to let you know that the playgym arrived here on Friday. I picked it up on Monday. Finally had time to open it today. I am impressed. It is well made. I know my bird will enjoy it. He was excited watching me open it up. Also wanted to thank you for getting me that cheaper shipping fee. Your customer service is excellent. Thank you for fitting my order in before your business trip. I received the Junior playgym promptly and at a great price. Excellent service with a personal touch, quality products! Kira, my one year old Eclectus was just starting to chew her feathers, but thanks to your really interesting & fun toys she stopped this destructive behavior. Thanks for inquiring about the playgym! What great customer service. Your playgym was very easy to put together, and the directions were excellent. I found your company by cruising the web. I had Googled "bird play gyms", and I started to check them out, and I liked the thought that went into yours (toys at eye level, etc). I think it's a great gym, and the toys are just great too. I just wanted to take the opportunity to thank you once again for an excellent product and the superb service you provided me with. You were right on about the soft plastic...I'd always been suspicious but took your word. Well, it arrived today! That was SO fast! It looks beautiful. It is certainly everything you said it would be. Of course, we could not wait for Christmas, so I let Bailey the (sun conure) on it after letting him just look at it for a while. The toys are terrific, and I think your price was very reasonable. I am part of a cockatiel message board, and I will be telling folks there of my satisfaction with your products and service. Hey, it just occurred to me that now both my birds and my daughter are sophomores! Take care, and thanks for such quick service! I wanted to tell you how much my birdies loved the toys I got from you. Zuzu (BFA) is a beaver with wings....she eats through everything. She attacked each toy as soon as I put it in the cage. Great cage, great toys and excellent customer service! I will definitely try and snap a picture of Paprika playing with the toys. Those popsicle sticks are ingenious! She likes them a lot! She also loved the free treats you sent. Thank you very much for the fast shipment. My bird loves her new playgym. She is a Jenday Conure and she is having a lot of fun playing with her new toys. Wizard absolutely loves his new "Junior" playgym. He is so intrigued by the toys especially the keys on the Key Toy. He also seems to really like the square perches. I think the playgym is gorgeous! The colors are beautiful and the size is perfect. Thanks so much Wizard is the happiest bird thanks to you. This is Heidi. I did receive my order and was very well pleased with it. It was more than I had expected. The FunTime Birdy gym is beautiful to look at with all the bright colors and everything. You did a fabulous job designing it. There is no comparison, no other gym can top this one at a great price. I ordered the gym yesterday and it arrived today! Diego, our Quaker, has already been eating from the food cups and playing with the toys. My lovebird Ziggy enjoys his playgym. He particularly enjoys the toy with the wooden craft sticks. When I put him on it the first time, he hopped up on the food cup and gave a series of loud chirps as if to announce, "This is mine!" The playgym is sturdy and attractive and fairly simple to assemble. It is a good quality product. I am very impressed with your follow-up!! I have an adorable baby (4 months old) Parrotlet named Timmy. He is climbing around on the toys. He steps up on the different levels of the perches. I'll try to remember to get some picture. I would love to show him off!!!!! Always a pleasure to buy from FunTime Birdy. The playgyms and toys are excellent and my birds love them. Excellent prices and customer services. I was web surfing and found your website. What a cute name for your business. I was so curious and I will tell you, I have a Double Yellow Headed Amazon, Norman and he is crazy about your toys. The birds love it. The gym gives them something to do when they are out of the cage, which is more often now. NO THEY DO LIKE IT . I DO TOO. IT IS ON TOP OF MY TV STAND SO THEY GET TO SEE MORE OF WHAT GOES ON. PLUS PLAY WITH THE TOYS ON IT. 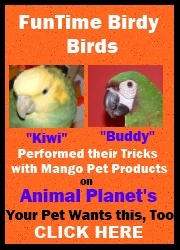 I SEEN YOUR AD IN THE BIRD USA BOOK. LOOKED THROUGH A COUPLE OF ADS IN THE BOOK BUT YOURS JUST APPEALED TO ME AND THE PRICE FOR THE QUALITY LOOKED GREAT TOO , AND AFTER I GOT IT, YOU HELD UP YOUR END AND I GOT A GREAT TOY (GYM). SALT AND PEPPER LOVE IT TOO. I WILL SEND A PICTURE OF THEM TO YOU AS SOON AS I CAN. BUT THANKS FOR SELLING SOME GREAT PLAYGYMS. I WILL BE KEEPING MY EYE OUT FOR NEW STUFF YOU MIGHT HAVE. Buchi is a red tail Amazon, and he loves his play pen. I saw your ad in Bird Talk, I went to several websites and tried to find a nice playpen for him that I could move from room to room and for him to play on. He enjoys the toys, I am still teaching him to play with them little by little. I will send you a picture as soon as I can. Thank you very much. FunTime Birdy is a new advertiser in the CPQ and we love the TROPICAL OASIS JUNIOR PLAYGYM that they sent us! This fabulous tabletop playground keeps our guys entertained to the point where they don't even know we're around! The perches are low so they can easily climb down and around to explore all the fun activities. Of course, their first interest is investigating the two food cups that are strongly attached to the two outer perches. But after that they discovered the hanging toy bars. Many playgyms are not utilized by parrots because they tend to go the top and sit. This one is different because it has been specifically designed to encourage play and discourage sitting on top of the gym. Pascal our little Amazon with stenosis in her back can easily putter around comfortably to her delight and RoxiAnne our one-legged bare eyed cockatoo hops on and off the low perches without a care. They both enjoy tearing the roll of adding machine paper and nibbling on the alphabet blocks that are conveniently located within easy reach. This would be a great addition to any parrot's home. It could be fun on or near the dining table so that dinner and breakfast could be shard or, perhaps next to your easy chair or office chair so that your parrot could keep you company while you watch TV or work on the computer. It's quite easy to put together with a pair of pliers and a screwdriver and very transportable to move from room to room. This is the first time ever that a vendor has actually contacted me to determine whether I am satisfied with a product that I ordered over the internet. I am pleased to report that Pickle loves the playgym, and has already made great progress in chewing and destroying the "willow tree" toy attached to the stand. I will take her picture on the playgym this weekend and e-mail it to you. Thank you for a great product, and for creating a product that keeps her occupied and happy. Pickle is a great bird with a winning personality, and I want to keep her that way!! Thank you too for you great follow up and for actually caring about my satisfaction with your product. I am certain that I will order again. For your information, I found you through an internet search on google for Parrot playgyms. I scrolled through a number of other sites before I found yours. Yours was the best product from the standpoint of design and functionality. My birds really loved your Junior Spider toy. My cockatoo demolished it though I did save some of the pieces that were salvageable to restring! The blue-fronted amazon really loves it and it's so funny to see him walking around with little fishies in his mouth! I'll definitely be ordering from you again as the birds really like your toys. As a pet store owner, I feel your playgym outperforms other playgyms I sell. One of the best features of your playgym that makes it stand out above the rest is the toys at eye level. WOW! That's what I call customer service! You guys rock! Most website businesses only claim to have customer service. You really care. The playgym arrived today. My grey, Casey, loves it! He was hesitant for about 10 minutes, but now he is playing on it for about 2 hours. I know that you have a very good product that people need. Our birds love it and it does exactly as you said-- they cannot sit on the top where the chain is, and be bored all day. They play with all the toys, particularly the one with the popsicle sticks, and go up and down the ladders to the perches. They are far more entertained with your play gym, than with the ones with a perch on the top. I knew that you had a good idea the minute I saw it. I'll send you a picture of our bird enjoying your gym when I get the chance. Piper loves the Sophomore playgym. It is just the right size for her and she can move around easily. I'm thrilled with the fact that I can get replacement parts. I will try to send pictures. You've got a great product! Your toys are really incredible, and the boys TRULY love them, even my little picker, Maka, who LIKES chewing on the plastic pieces. Zeke, my gray, is enjoying the lady coconut toy! And I REALLY appreciate you wrapping the toys in plastic instead of newspaper. I just received my "Sophomore" playgym today. I really like it; and so does "Peanut" my 5 month old Black Headed Caique. I am glad we bought our playgym from you! "The birdies LOVE their playgym! The first bird who got to explore on it, stopped at each toy and nibbled it, and just sat there as if I gave her the best present of her life!!!!!! It was priceless!!! All the birds have found their favorite place on it. Everytime I turn to look at them, they seem to pose for me! It is fun! Cleaning it is also a breeze, as it is so sturdy I get to flip it over and shake it to get any stray treats off of it, and then just sweep them away." Zeek loves his new toy and thank you very much. He plays with it everyday as Zeek is our brand new addition and he had not many things to play with now his cage is full of love toys.